The most commonly dreaded task RVers face is dumping their gray and black dump tanks. The gray tank holds water that comes from showering and doing the dishes, while black tanks hold the really icky water that comes from the toilet. It includes all of the waste from the toilet as well. It’s no wonder this task is as dreaded as it is. Fortunately, RVers are a friendly group of people and happy to share knowledge they’ve gained along the way. Here are 5 tips to make disposing of your waste easy and less messy. 1. Carry a spare hose to hook up and rinse your sewer hoses. Make sure that this hose is stored in an area where it does not come in contact with your drinking water or fresh water hoses. Never use your fresh water hose to rinse sewer hoses as that contaminates them and could spread germs to you. 2. Although it might seem tempting, never leave your black water valve open. This will not only stink up your camping area and waft into your RV and your neighbors, but also will cause a mass of solids to build up in your black water tank, which is infinitely harder and more disgusting to clean. 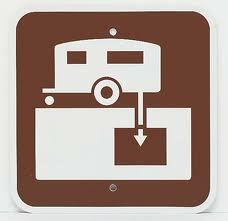 Even if you’re boondocking, don’t leave the valve open, as you don’t want to contaminate the area you’re in. 3. Try to use non-toxic, ecologically friendly cleaners to clean your gray and black water tanks. Although you aren’t drinking the water, the fumes that more toxic cleaners can produce can leak into your RV and make you sick. Additionally, earth friendly cleaners help you do your part in preserving nature for future generations. If they leak or spill, there’s no worry they’ll harm the area. 4. When you start to drain your tanks make sure you drain the black water tank first and then the gray. This helps you push any solids from the black water tank that might have been caught in the hose and also allows you to “clean” the hose prior to putting it away. 5. Keep a 10 and 20 foot sewer hose in your RV along with a connector coupling. This allows you to be able to accommodate several different situations where the sewer pump might be closer or further away. Draining your RV’s black and gray water tanks isn’t fun, but with these tips you’ll be well on your way to becoming a pro. The most important thing to remember is to respect those around you when pumping your tank and to have fun learning all you can about RVing. One day you’ll share your knowledge with other RVers.